For some, winter is one of the best seasons in West Michigan. No crowds...the air is fresh and clean...and snow provides some of the best entertainment around! Here in Manistee County, there are numerous places in which to enjoy this time of year. Choose your activity--snowshoeing, snowmobiling, cross country skiing--and you'll find a wide open space that's waiting for you! About 14 miles east of Manistee off M-55 is Big M, a premier cross country ski area in the heart of the Manistee National Forest. The narrow trails wind through the pines of the forest and is maintained entirely by volunteers and contributions. For safety, the trail system is mostly one-way and you are asked to follow the "One-Way" and "Do Not Enter" signs. Pets are not allowed, nor are any motorized vehicles. These trails are primarily for cross country skiing and snowshoeing. During the spring, summer, and fall, Big M is open for mountain biking. There is a trail shelter...the perfect place to stop and warm up next to the woodstove. Various events are held throughout the winter, like the Moonlight Ski or Chili Feed. Within Big M, there are various trails to match your skill and endurance. Challenging trails include Capper's Peak at .8 miles uphill from the parking lot, the Catamount at 3.72 miles, and Oh Me II at 2.94 miles. 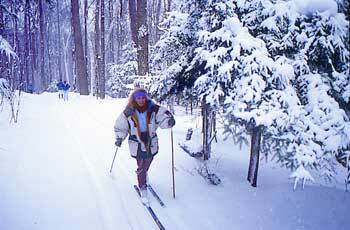 The Lumberjack (1.68 miles) and Corkpine (2.8 miles) are original beginner cross country ski trails. From M-55, take Udell Hills Road 3.5 miles to Big M. There is no cost to use the trails. Caberfae is a favorite downhill ski resort, located off M-55, just east of Cadillac. It features 34 runs with 485' of vertical drop, two double chairlifts, one triple and one quad chairlift. It boasts the largest day lodge in Northern Michigan with a stone fireplace, pub, and cafeteria. Caberfae's full service rental shop carries the top brands...and enjoy ski-in, ski-out lodging with an outdoor heated pool and hot tub. Season passes are available and many other special events save you money...like Family Fun-Day Sunday and College Night. Caberfae Peaks is open Monday-Thursday 10am-9pm, Fridays 10am-10pm, Saturdays and Sundays 9am-9pm. Crystal Mountain Resort & Spa is located 30 miles north of Manistee in Thompsonville and is another popular ski resort with 45 slopes. 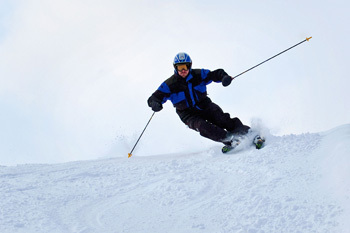 In addition to downhill skiing, you can enjoy other activities, such as snowshoeing, dog sledding, fat tire snow biking, horse-drawn surrey rides, ice skating, and hockey. They feature a spa, lodging, fitness center, and retail shops. Lessons are given at Crystal Mountain and season passes are available. 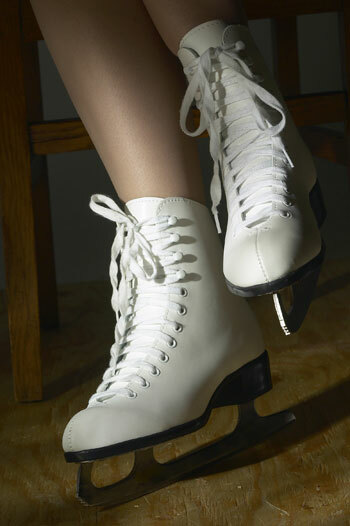 Throughout the season, they offer game nights, fun child activities and family-friendly events. 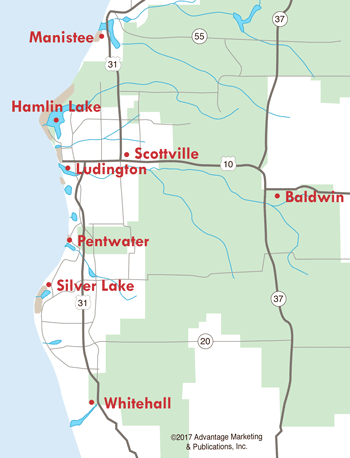 Just 20 miles south of Manistee is West Shore Community College, which features West Shore Community Ice Arena, an indoor ice skating rink that has open hours for the public. It is also home to the West Shore Wolves Amateur Hockey Association, and the Manistee Chippewa Junior Varsity and Varsity Hockey teams. It's a great place to catch a local hockey game during the winter months. Across from the Ice Arena is the Rec Center, where an indoor pool is available for the public to use for a nominal fee. If all that isn't enough, grab a sled or toboggan and find the closest snow-covered hill. You'll feel like a kid again and this activity won't cost you anything at all. The winter months don't have to bring you down. Head to Manistee County for outdoor fun that never ends!